My favorite chili recipe updated with ground turkey! 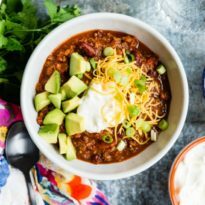 This easy, healthy Turkey Chili recipe will keep you full without weighing you down. Heat oil in a large stock pot or Dutch oven over medium-high heat until shimmering. Add onions, celery, chili powder, cumin, cayenne pepper, 1/2 teaspoon salt, and 1/4 teaspoon pepper. Cook until vegetables have softened, about 5 minutes. Stir in garlic until fragrant, about 30 seconds. Add turkey and cook, breaking up the clumps with a spoon, until the turkey is no longer pink, about 5 minutes. Stir in kidney beans, tomatoes, and tomato puree. Bring to a simmer and cook uncovered for 30 minutes. Season to taste with salt and pepper. Serve with preferred toppings including avocado and scallions.